NASA's Jet Propulsion Laboratory (JPL) has overseen the design, construction and operation of many NASA space missions. 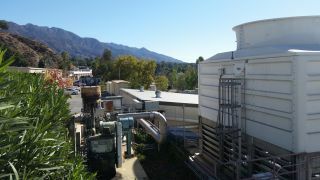 I recently took a tour of the facility, which is nestled in the San Gabriel Mountains in Pasadena, California. Originally a place where students could work with rockets, JPL has now grown to a sprawling expanse of buildings. This was our first stop on the tour. The spacecraft assembly building includes an enormous clean room (hence the workers wearing white clean-room suits) that hosts multiple projects. Here, we see another view of the spacecraft assembly room. The heat shield for Mars 2020 was one of the projects in the spacecraft assembly room. Next to the heat shield sits more flight hardware. The hardware is covered in signs warning people to avoid the flight hardware. Ken Farley, a project scientist for Mars 2020, talks about the mission. My intern/daughter, Dawn, poses with the giant globe in the Earth Science Center. Our last official stop on the tour was the Space Flight Operations Facility. We got to see the famous "lucky peanuts!"